Your makeup bag may be overflowing with Cosmetic Cosmos makeup, but if you want to get the most out of your makeup, you have to have the right cosmetic brushes to get the job done. Cosmetic Cosmos has an assortment of makeup brushes and makeup brush sets to keep you looking your best every day. There are many types of makeup brushes, and each one serves a different purpose when applying makeup. For flawless coverage, apply foundation using one of our mini foundation brushes. When you use one of these foundation brushes, your foundation will stay on the surface of your skin, instead of being rubbed into pores, which is what happens when you use a sponge applicator to apply foundation. Our blush makeup brush is the perfect tool for applying blush or bronzer to your cheeks and face. This blush brush is handmade, hand woven and hand shaped of all natural, high quality first cut hair. Use a powder brush to apply loose powder foundation. 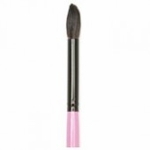 Our giant powder brush has soft bristles for easily applying loose powder and foundation. There are many different types of eye makeup brushes, but the essential ones that everyone should have is an eyebrow brush, eyeshadow brush, blending brush, concealer brush and a crease brush. You can find more information about these and all of our natural hair cosmetic brushes online at CosmeticCosmos.com.